If the Pacific Ocean was once a Spanish Lake, then the Indian Ocean during the 16th century belonged to the Portuguese. 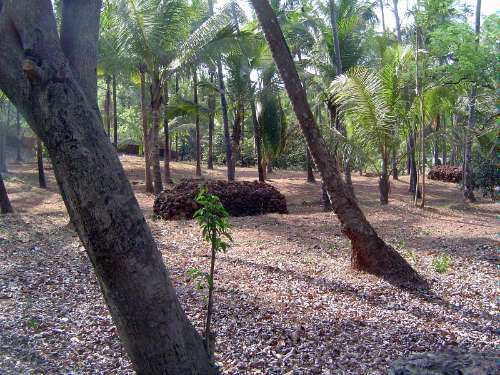 The administrative center of this Portuguese Lake was Goa. What did it look like? Most of the city of that time has been obliterated, partly by time but largely by the Portuguese themselves using it as a stone quarry. Well, here we are, a busy street 400 years ago. Jan van Linschoten, assistant to the archbishop and in modern language also an industrial spy, wrote that one street was crowded with cotton and silk dresses, China porcelain, and velvet from Portugal. Another was for woodworking--beds, chairs, joinery. 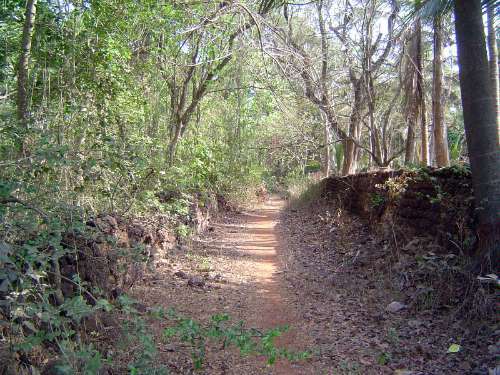 Linschoten did more than describe the commercial geography of Old Goa: he copied the maps long held secret by the Portuguese, and when he brought them back to his Dutch countrymen, they began sailing the Portuguese Lake, with ruinous effect for the Portuguese. By 1774, Portugal's eminent Marquis of Pombal sent out a new governor with instructions to restore the city's glory. 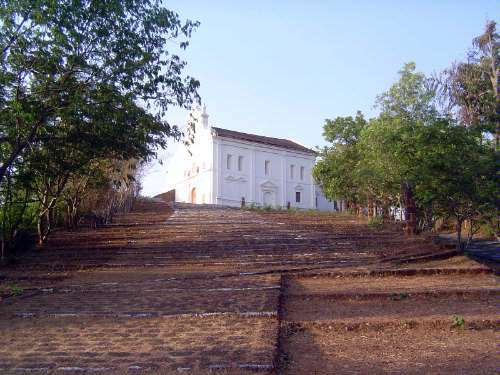 It was not to be, but Pombal's instructions to José Pedro da Camara describe Goa by then as "overtaken by such calamities that she is reduced to a heap of ruins; so that she is now a mere wreck of what she was in happier times" (Fonseca, p. 183). 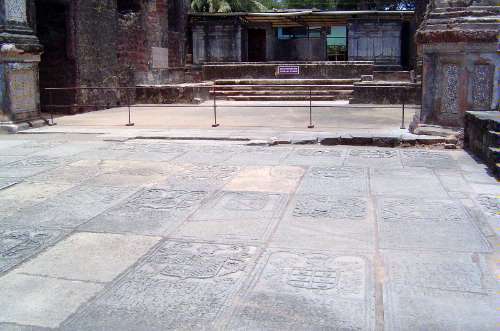 It almost takes an archaeologist to sort it out: the relics of ancient Goa are not the stone blocks in the upper half of this picture. They're the thin fragments of roof tile in the lower half. 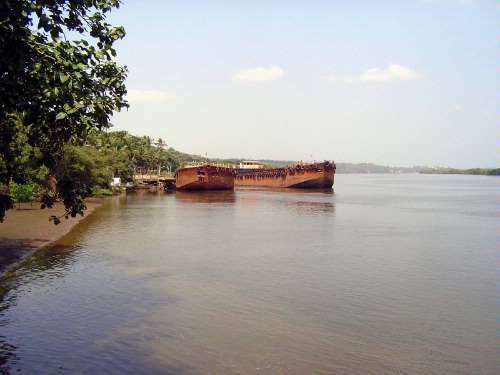 Visitors today arrive by road, but in the old days they came up the Mandovi River, here at low tide five miles from the sea. There's a lot of bulk-carrier traffic, as well as ferries on the river, but no oceanic passenger ships. Vasco in his Sunday best. 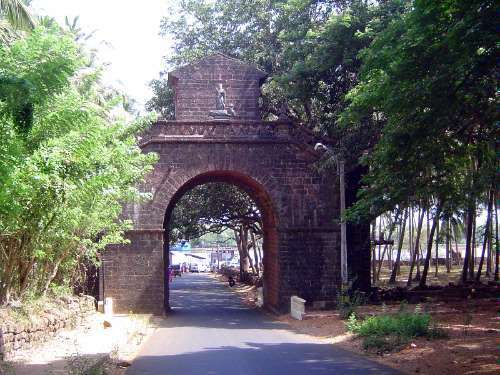 Although Vasco came to India in 1498, Portuguese rule over Goa was established instead by Afonso Albuquerque, who in 1510 defeated the forces of the Sultan of Bijapur. It happened on November 25th, the feast day of St. Catherine, which is why her image originally appeared above Vasco's. 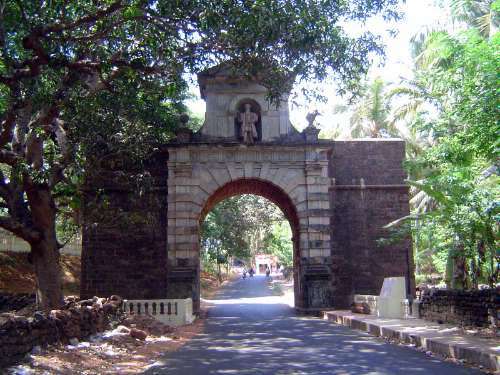 Rear of arch, with view through to ferry dock. Notice the statue at the top of the arch? It shows a woman, sword in hand, standing over a man in native dress. Symbol of Portugal's rule? Inside the arch is this tablet. 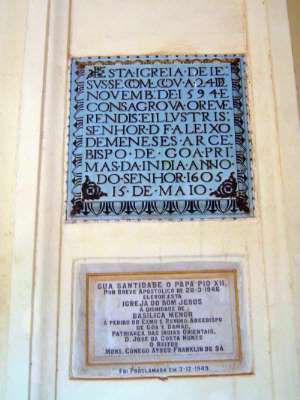 The upper portion reads: "The legitimate and true king, Dom Joao IV, restorer of Portuguese liberty. 1656." The reference is to Portugal's regaining in 1640 its independence from Spain. 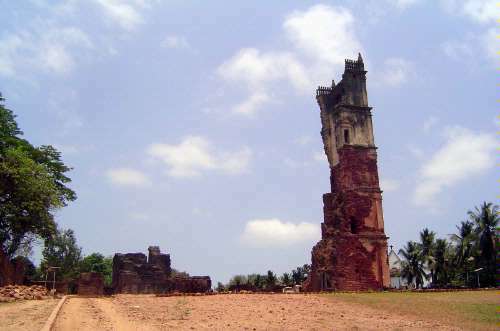 Perhaps a hundred yards up the road is this last vestige of the palace of Yusuf Adil Khan, the last Muslim ruler in Goa. 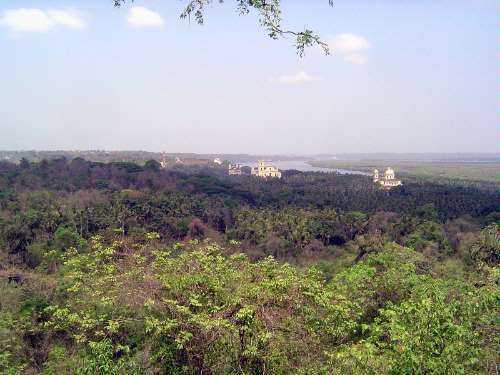 For a long time his palace was used by the Portuguese viceroys, but they eventually moved their capital downstream to less cholera-prone Pangim (=Panjim =Panaji). 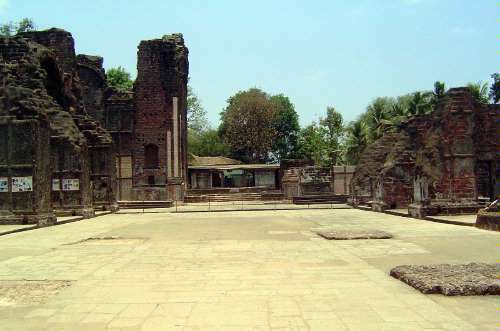 In 1820 Adil Khan's palace was demolished and its stone reused in the new city. Only this gateway survived. 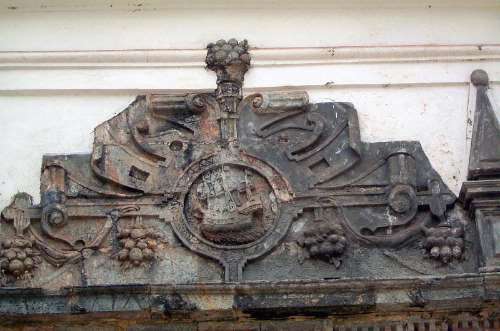 The design is Indian except for the scroll on the lintel, which is Portuguese. 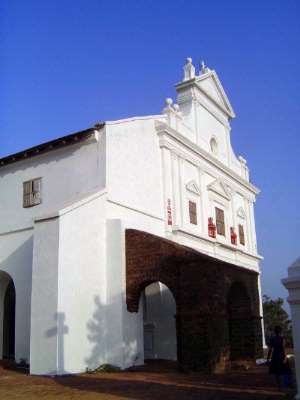 Next to the relic gateway is the Church of Our Lady of Divine Providence, completed in 1661; to its left is the S. Caetano (= Cajetan) Monastery, named for the founder of the Theatine Order. Caetano came from Thiene, west of Venice, and was a contemporary of the better known St. Francis Xavier. 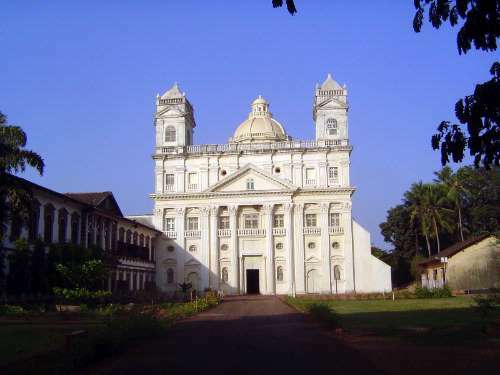 He arrived in Goa in 1639 and, failing to get permission to proselytize within the dominion of the Nizam of Hyderabad, settled here after swearing allegiance to the Portuguese king. The Theatines were unusual in accepting non-Europeans to their order. The floor plan of the church is a Greek Cross. The base of the dome bears Matthew 6:33, "Seek ye first the kingdom of God and His righteousness and all these things shall be added unto you." It was no random choice, because the order taught reliance on Providence for subsistence. 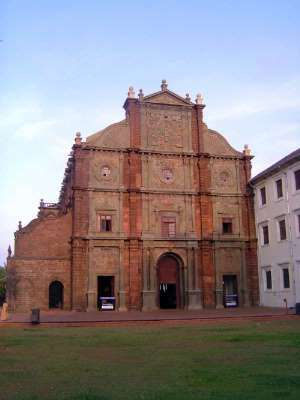 The church was designed by two Italians, Ferrarini and Milazzo. 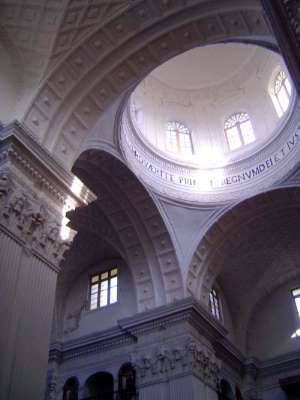 Often described as a smaller version of St. Peters, the church was modelled more directly on the church of the Madonna della Ghiara, which is in Reggio Emilia and which was based on Bramante's unexecuted design for St. Peters. 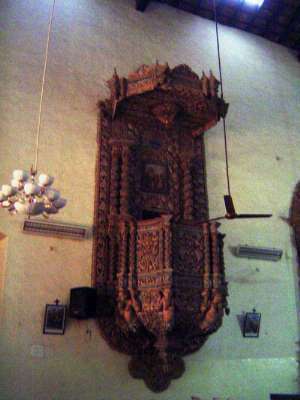 The elaborately carved pulpit is characteristic of Goan churches. 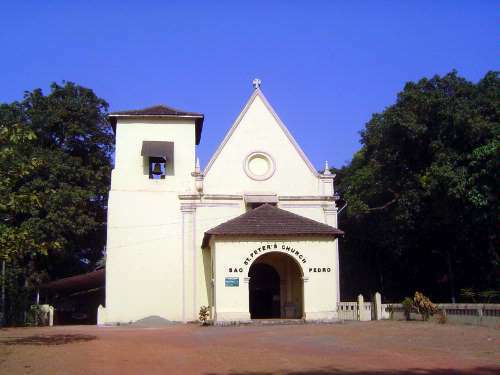 Goan churches are generally made of blocks of laterite, which when excavated from the earth hardens to ironstone. 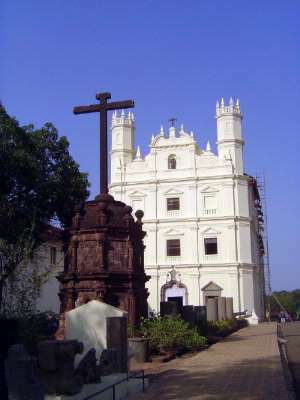 That rock is durable but cannot be carved, so the Goan churches are typically covered with plaster and periodically given a coat of white paint. 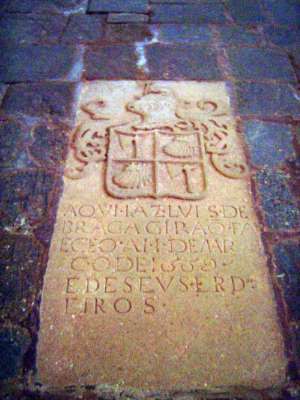 "Here lies Luis de Braga Girão. Died 11 March 1669 [?] and his heirs." Perhaps a mile away, there's a hill atop which stands the Church of Our Lady of the Mount. 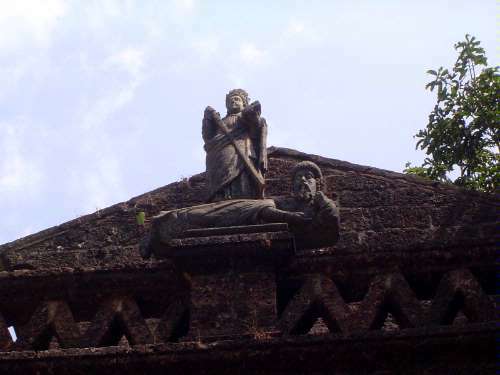 Like many churches in Goa, it's been inactive for a long, long time. Even in 1878 there was only one service here annually, on the festival of Our Lady of the Mountain. 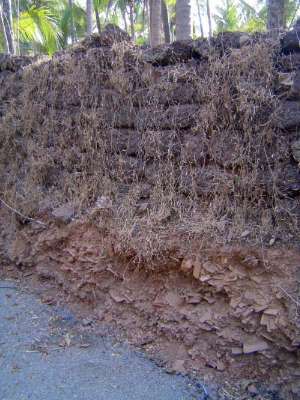 The steps are of laterite, the same material used in building the church. The church was described in 1992 as "deserted and decaying," but since then it has been restored. The church is closed, but there's always a way. 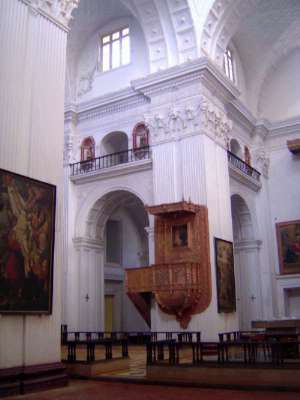 View from choir. 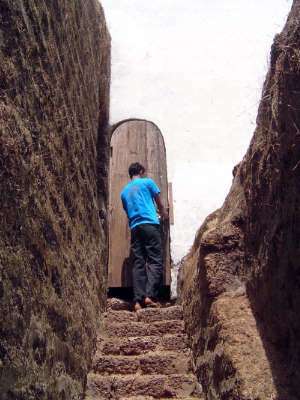 The roof is a 9-meter wide cylinder or barrel vault and rests on laterite walls 2.7 meter thick. The view west from the church. The church on the right is the one seen earlier; we'll look now at the others, beginning with the dark tower just breaking the skyline at the western edge of the cluster of buildings. 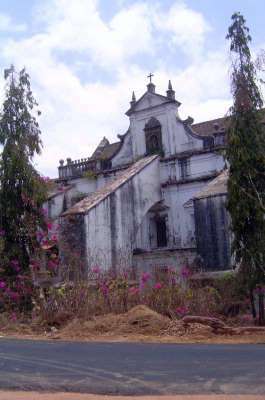 It's the only surviving bit of the superstructure of the Augustinian church of Our Lady of Grace, which was completed in 1602 and abandoned when the Augustinians were ordered to leave Goa in 1835. The massive roof collapsed a few years later, in 1842. Most of the facade fell in 1931. The remaining tower has been stabilized. The rubble on the left is the remnant of a great staircase that once led up a low hill to the church. Here lies Captain Iacome de Moraes. Died 20 July 1624. Across the street is the huge convent of Santa Monica, once a popular place of permanent seclusion but by 1876 down to a single nun. 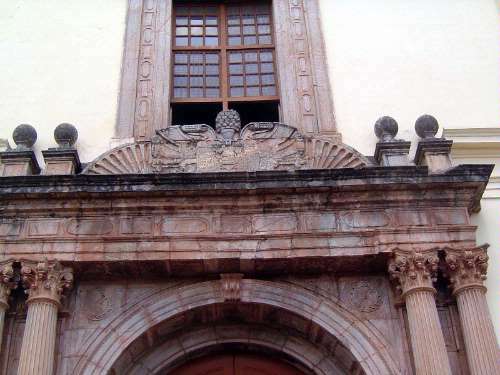 The doorways bear elaborate ornamentation, which is odd since the women inside were not allowed to leave, while visitors were far and few between. Still, it appears that the phrase Liber Vitae Agni was apt. It presumably comes from Revelations 21:27, "And there shall in no wise enter into it any thing that defileth, neither whatsoever worketh abomination, or maketh a lie: but they which are written in the Lamb's book of life." 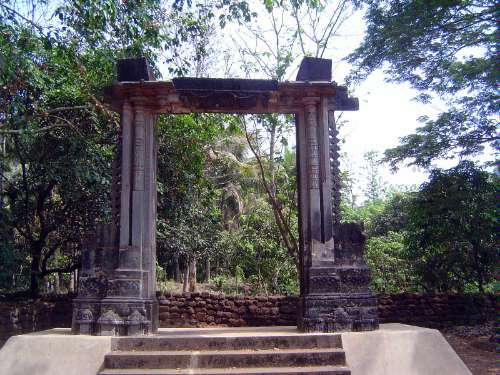 Another entrance is less clear, although certainly the presence of the Portuguese in Goa was a story of the sea and its voyagers. 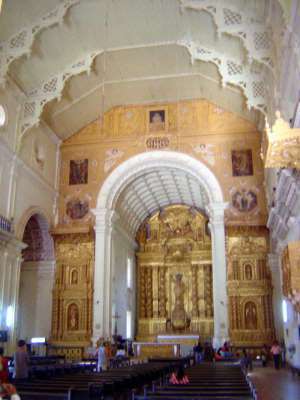 The most important surviving building in Old Goa is the Se or Cathedral, completed in 1652, when Portuguese power was already in decline. 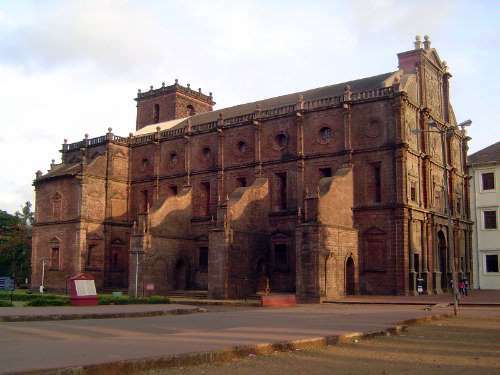 It's formally the Cathedral of St. Catherine, the patron saint of Goa because it was on her day that Afonso Albuquerque finally captured the city and ordered the slaughter of all Muslim residents--man, woman, child. Thousands died, punished it seems because the city's rulers--Muslims--had earlier welcomed Albuquerque, then turned on him, forcing him to fight to regain his hold on their city. Despite this slaughter, Albuquerque subsequently pursued a policy of toleration, at least with regard to Hindus. 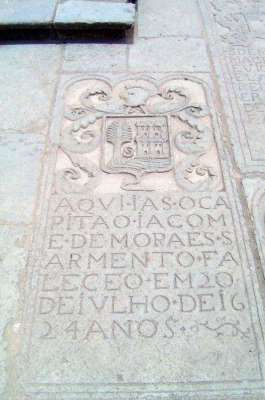 The inscription reads, "In the reign of the very catholic King Dom Sabastiao this cathedral was ordered to be erected... in the year of our Lord 1562...."
The cathedral was begun by an unknown architect who modeled his work on the cathedral at Leiria. 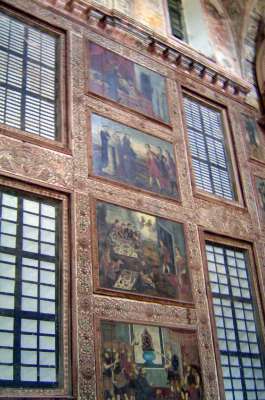 Most of the work, however, was done under the direction of Julio Simao, appointed chief architect of Portuguese Asia by Philip II. 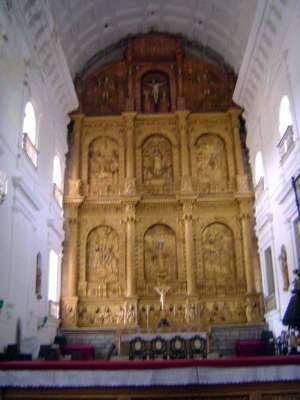 It's a reminder that the church was built while Portugal was under Spanish rule. 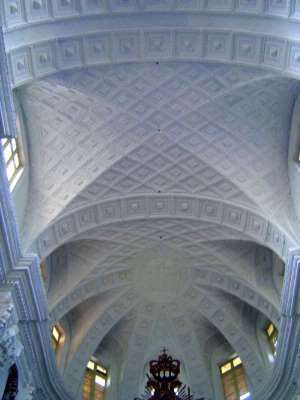 Simao finished the nave in 1622 and the crossing in 1628 but died before the portal was finished in 1651. He's buried in the church. The high altar shows events from the life of St Catherine of Alexandria. The central image on the lower level shows Catherine holding a book and sword while standing on a cloud. 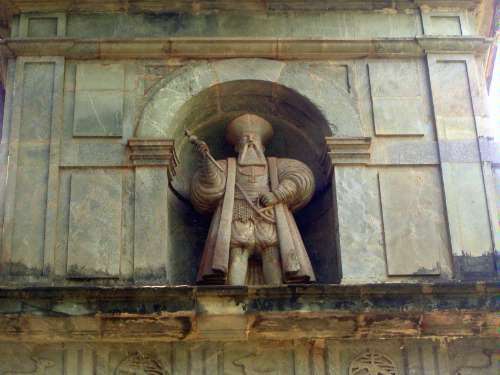 The symbolism is obscure until you learn that the "cloud" was originally a picture of the prostrate Sultan of Bijapur. 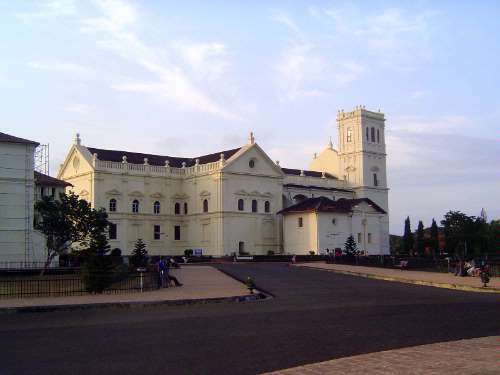 Adjoining the cathedral is the Church of the Holy Spirit or, popularly, of St. Francis. It's late, completed in 1668. 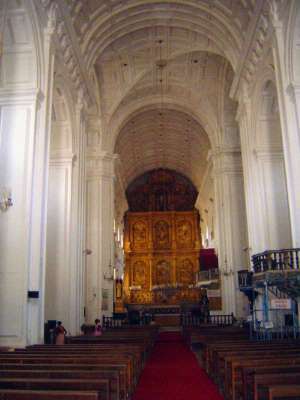 The church is a single hall, a nave without aisles, and is entered through a wide arch. Paintings illustrate scenes from the life of St. Francis. 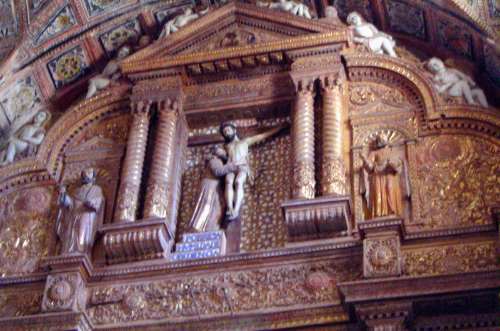 The high altar has a surprisingly informal image of Christ on the cross but with one arm on the shoulder of St. Francis, who embraces him. Francis stands on steps labeled Poverty, Humility, and Obedience. 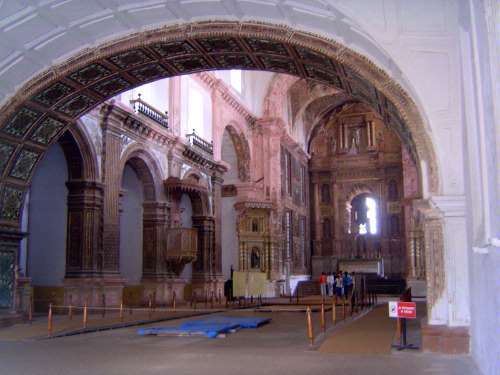 Not three minutes away is the Basilica of Bom Jesus, built quickly and finished in 1605, before any of the other churches we've seen, except for the Augustinian church now in ruins. 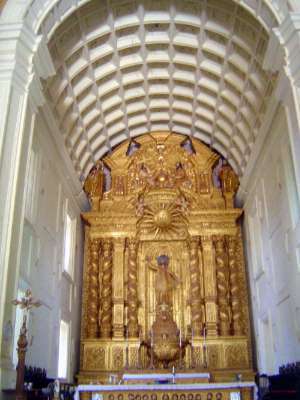 Once, Bom Jesus was plastered and painted. 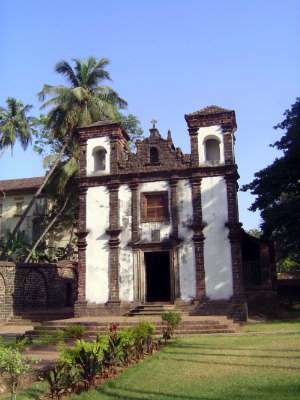 The facade is partly of a dark granite from Bassein, north of Bombay. Why? Because granite can be carved, unlike the laterite blocks used elsewhere in the church. The church is attached to what was once a training academy for Jesuits. 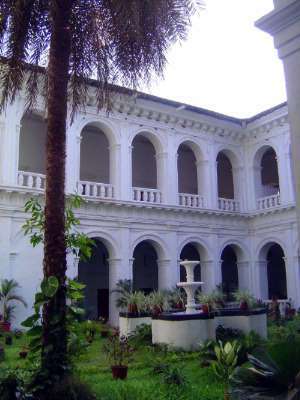 Courtyard of that monastery, now the Pius X Pastoral Institute. 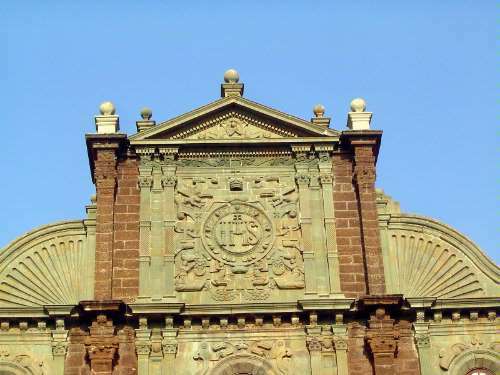 Top of the facade, with the Jesuit seal in granite. 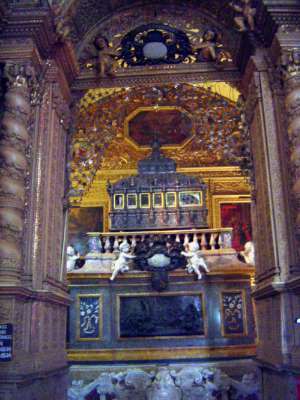 The high altar has a larger-than-life image of Ignatius of Loyola, founder of the Jesuits. Francois Pyrard wrote soon after 1600 that he saw a procession of 1,500 natives coming here to be baptized. The crowds today come mostly to see the tomb of Francis Xavier, which is in the right arm of the crossing. Ignatius Loyola stands atop a small Christ child. 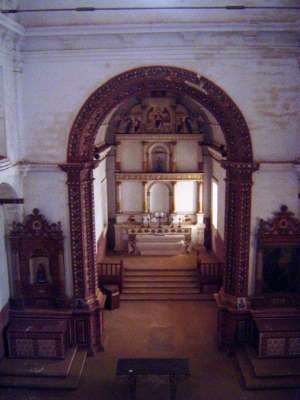 Most of the church appears to be very simple, almost austere in contrast with the altar, but Pyrard wrote that the walls were gilt. The casket of Francis Xavier, a Basque Jesuit who was an associate of Ignatius of Loyola. The great missionary of the East, his body was brought here from China after his death there in 1552. Francis Xavier was canonized in 1622; this catafalque, of jasper and marble, was sent from Italy by the Grand Duke of Tuscany in 1698. 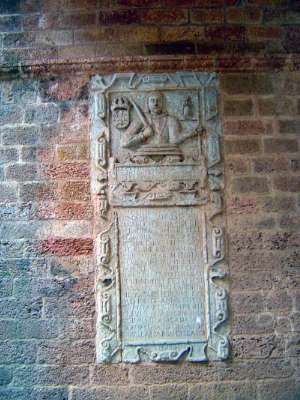 The upper tablet reads: "This Church of Jesus was begun to be built on the 24th November 1594, and the most Reverend and Illustrious Lord Dom Fr. 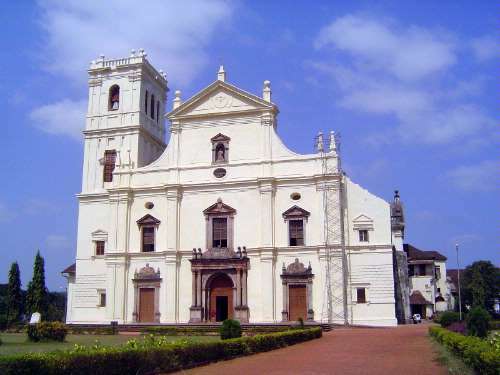 Aleixo de Menezes, Archbishop of Goa and Primate of India, consecrated it in the year of our Lord 1605, on the 15th May." The lower stone marks the elevation of the church to a Basilica Minor in 1946. Off to one side of the complex of major churches we've been looking at is this small Chapel of St. Catherine, built by Albuquerque in 1510, though enlarged in 1550. 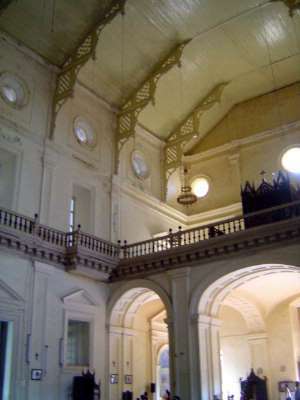 As Portuguese power waned, Portuguese churches grew larger. 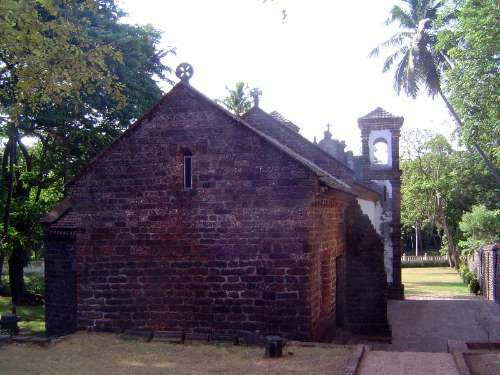 Rear of the church, showing the characteristic laterite blocks. 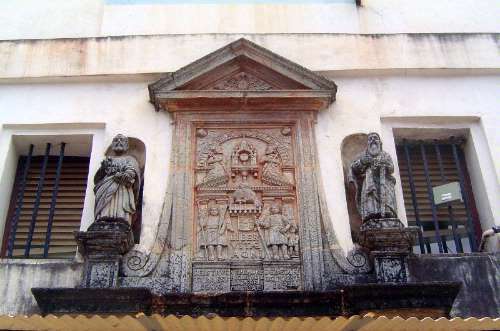 Another early church, Sao Pedro, from 1542 or 1543. Supposedly, there's nothing special about it. Except that it has one of those amazing pulpits, prodigies of woodcarving.